It has been a long time I posted something on my website. I was busy learning about NoSQL , mainly CouchDB. 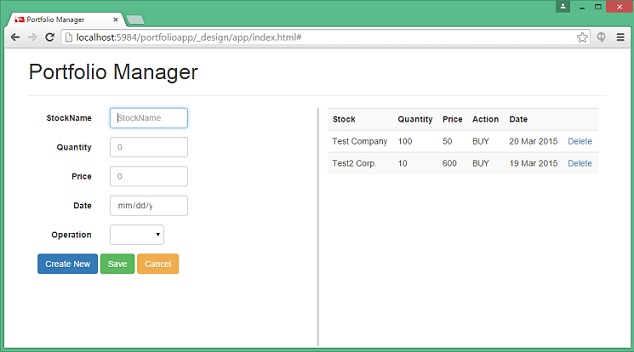 So, in this article I show you how to create a basic portfolio management web application using CouchDB and AngularJS. Our application will allow the user to add entries to a stock portfolio. Each entry will capture name of the stock, quantity, price, transaction type (bought/sold) and the date when the transaction was carried out. Also a section on the page will show list of entries in the portfolio and allow deleting and selecting a particular entry (for editing). What is so special about CouchDB ? As you may have already read, many NoSQL databases store data in form of documents, so does CouchDB. What is different with CouchDB is it acts like a webserver for your application. Yes, a single server that acts like a database and application server. Using a framework like AngularJS and flexibility offered by schema-less design of CouchDB, a broad category of web applications can be created painlessly and fast. In this article, I cover the process of creating the Portfolio application with CouchDB. CouchDB installed on your local machine. Please visit their website to download binaries for your OS. I have used Windows in this tutorial. NodeJS installed on your system. AngularJS and Bootstrap (which we will pickup from CDN). Luckily, CouchDB comes with online administrative tool by default, know as Futon. You can access Futon by starting CouchDB and visiting following URL http://localhost:5984/_utils/. 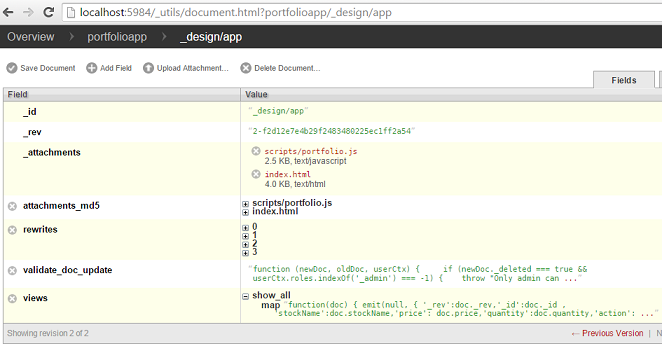 Using Futon, let us create our first CouchDB database, called 'portfolioapp'. This should be very easy. Since this is a NoSQL database, we don't have to worry about the schema. We can concentrate directly on creating our front-end/GUI. Futon showing the newly created database. Files added by CouchApp during scaffolding. Interesting thing to note is we have not definied a schema anywhere in our database, yet we are creating a view which assumes and uses some properties from our documents. This is fine because our application makes sure that every document it creates will have these fields. Hence we have not done any checking or error handling in the view (which we should ideally do). Thats it, we are done. We have created a GUI to perform CRUD operations for our application. The portfolioApp/attachments/index.html is our view which binds to the controller and allows user to view/add/edit/delete items. You can have a look at the file, it contains angular expressions for binding and event handlers on user actions. If everything went successful this is what you should be able to see using Futon. Our files are uploaded as special type of document with id '_design/app' . Inside this documents all individual files are stored as fields. You can now run the application by accessing http://localhost:5984/portfolioapp/_design/app/index.html. Try adding a couple of records like I did. 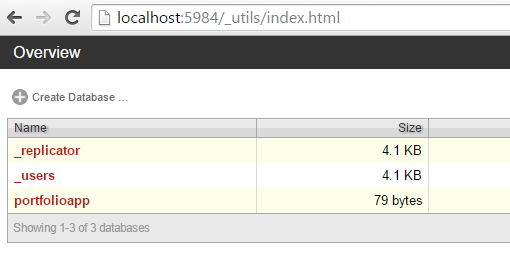 You should be able to see those in our UI as well as inside CouchDB with Futon. UI showing the two newly added records. New records in the database.